During the last minutes of the Broadway Basics class at Applause! 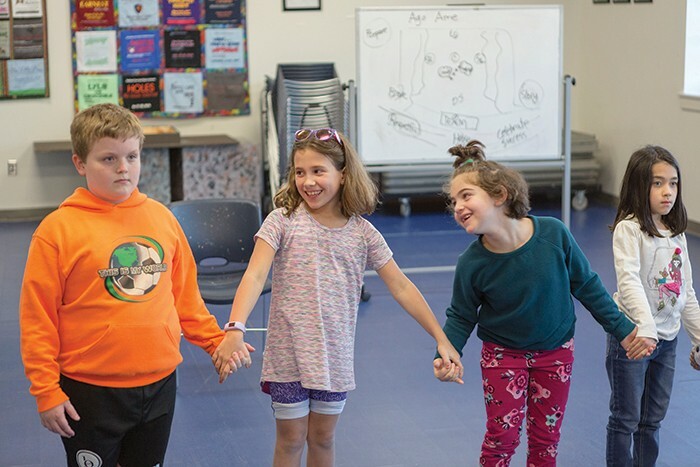 Youth Theatre, Reed Stallings, Gianna Marsini, Elle Comperatore and Lilly Watrous clasp hands to practice their curtain call, the simultaneous bow that happens at the end of every live performance. 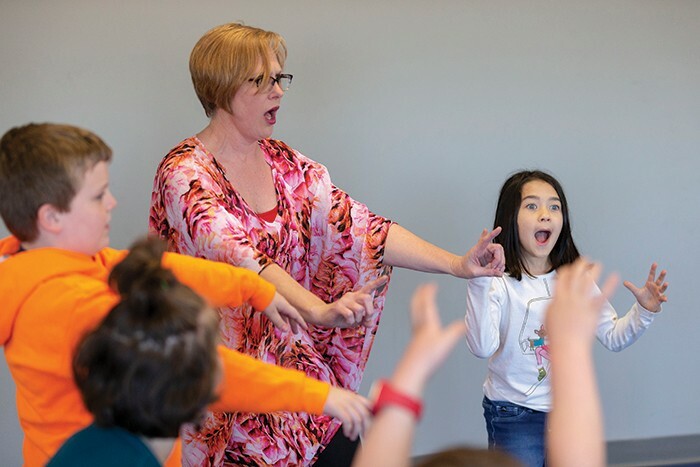 For the young students in Renee Wimberley’s beginning theater class, trauma might be the last thing on their minds — if they think about it at all. But throughout the hour, these youngsters are benefitting from community efforts to combat the effects of traumatic events and chronic stress. 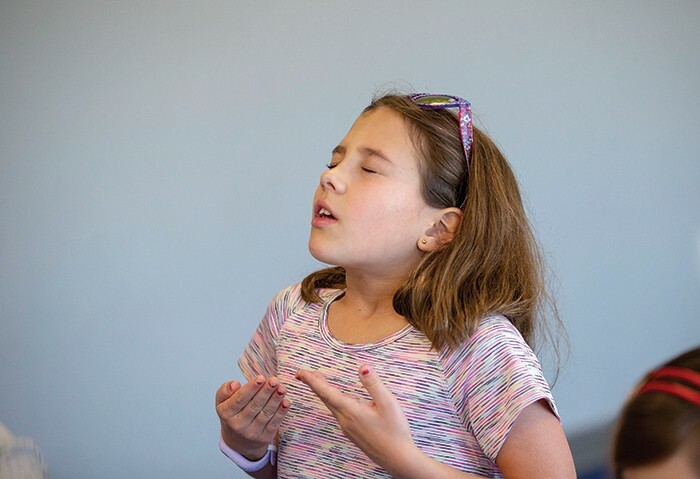 Before rehearsal begins, Renee Wimberley leads the 6- to 8-year-olds in a series of warm-up exercises to calm their jitters, warm up their bodies and help them focus on the hour they will spend together. As Wimberley invites the students to breathe deeply to settle their jitters and shake their limbs to warm up their muscles, she is teaching them how to calm themselves. As she gently reminds them to “let gravity hold your body down,” Wimberly focuses on the desired outcome instead of calling out disruptive behavior. At the end of the hour, as they practice their choreographed simultaneous bow, the students clasp hands, and there comes the inevitable teasing hard squeeze. 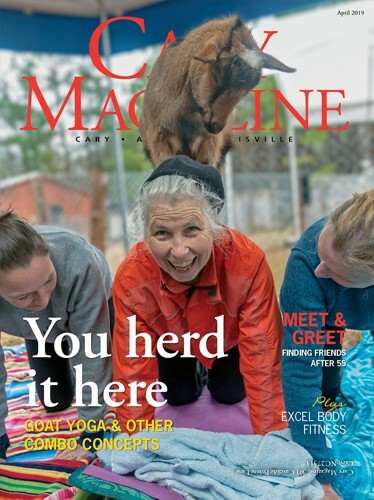 Four Town of Cary staffers have taken this idea of caring for each other to heart and were named Employees of the Year in 2018 for their efforts. Sam Trogdon, senior operations and program supervisor at Bond Park Community Center, along with Rachel Baranski, performing arts education specialist, and Cary police detectives Armando Bake and Elizabeth Pearson, came together after seeing the documentary “Resilience” in December 2017. The movie explores the negative lifetime impact of adverse childhood experiences, or ACEs, and how lives can be transformed by supportive relationships. ACEs are instances of abuse, neglect or family dysfunction such as divorce or mental illness. A CDC-Kaiser Permanente study in the late ‘90s found that roughly 64 percent of more than 17,000 adult participants reported at least one ACE during their childhood. The study further found that the more ACEs a person experiences, the higher their lifetime risk of substance abuse, depression, obesity, cancer, stroke and heart disease. These diseases were the physical manifestation of chronic anxiety and stress. In the last year, “Resilience” has been shown to hundreds of town employees, including police officers and firefighters. First responders, according to experts, can be particularly vulnerable to the negative effects of chronic stress, because they witness trauma regularly in their work. Among other efforts to bolster their resilience, peer support teams were set up for first responders. It’s helpful for employees to be able to put a name to something they’ve been through, Bake says, and to recognize that they can ask for help. Since April 2017, the nonprofit Advocates for Health in Action has partnered with Wake County and YMCA of the Triangle to build awareness of ACEs and their impact. AHA recently closed, but the nonprofit SafeChild and other community groups continue working to build community resilience. 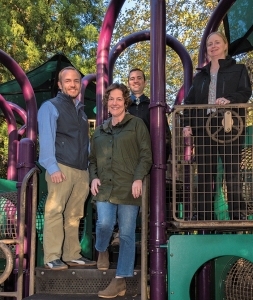 As a former member of the AHA board, Trogdon was the first of the Cary team to learn about ACEs, and he realized that the Parks and Recreation staff had an opportunity to build supportive relationships with youth and children. 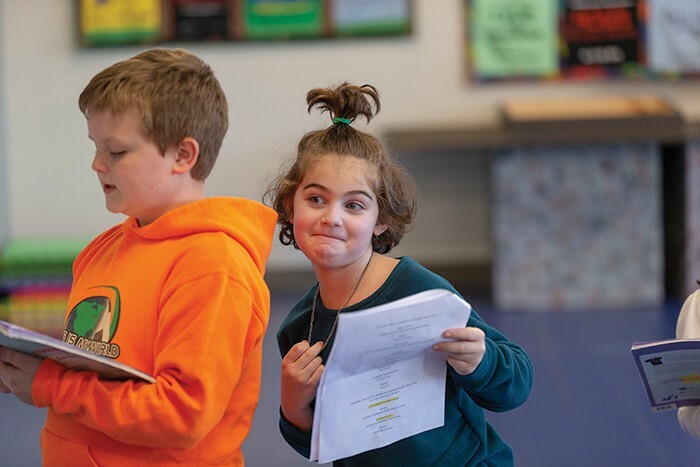 Reed Stallings, who plays the Beast, and Elle Comperatore, who plays Cogsworth, rehearse the dinner scene from “Beauty and the Beast.” Along with lines and choreography, the young actors learn to work together, to be respectful of each other, and to be brave when expressing themselves. “It’s not necessarily what’s wrong with you. It’s what’s happened to you, and applying that as we work with kids, work with youth, work with families,” he said. In May, Trogdon showed “Resilience” to nearly 70 summer camp counselors and seasonal staff and trained them on resilience-building techniques. At the end of the summer, he asked how the film and the training affected their experience. Parks and Rec staff also changed how they handled discipline issues at the summer programs. Baranski and her team at Applause! revised their discipline policy as well. This used to include prescribed steps: a verbal warning, a write-up, then some sort of action taken against the student. Gianna Marsini takes a deep breath before class begins. This “belly breathing” is a lifelong skill to help the students relax when they are in stressful situations. Applause! instructor Samantha Matthews says the trauma-informed training has enabled her to find more patience when dealing with negative behavior. As a way to quantify the effects of the behavior strategy, Baranski plans to track the number of disciplinary meetings with parents. At a broader level, she says the resilience goals have already helped the entire Applause! team work better together. Resilience-focused guidelines are posted prominently on the wall of every Applause! classroom. Instead of rules against talking, touching and running, the expectations set the stage for caring interactions. We are respectful. We try bravely. We celebrate others’ successes. We are a team. 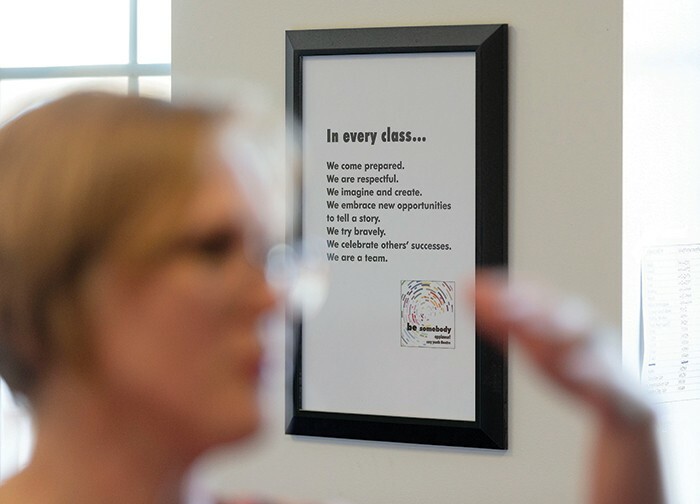 Wimberley, who teaches classes throughout the Triangle, says following the guidelines enables her and her students to build a culture of respect and inclusion. By encouraging caring behavior and empathy, these principles can have profound and sometimes heartbreaking results. She describes an Applause! musical theater camp she taught last summer that included middle- and high-school actors of all abilities performing improv, acting, singing and dancing. Everyone — even an actor’s service dog — was part of the show. “It was great to watch the children love, love, love each other so beautifully,” Wimberley said. As the camp ended, she explains, a sixth-grade student stood to say goodbye. He hadn’t wanted to go to the theater camp, he said, but since he was staying with his grandmother, she made him go. Wimberley says she fought back tears as he continued.